My hair is a mess. I have a 50/50 shot at having my hair looking decent naturally. Some days, my hair will have perfect curls. Other days, it’ll look like my curls are taking a life of their own. On those days where my hair is less than acceptable to my standards, I turn to Conair‘s amazing products. 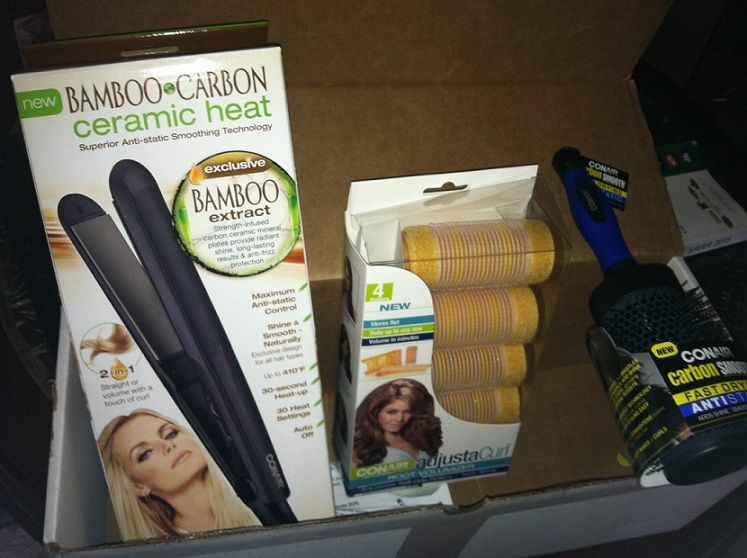 I received three products from Conair to review: 1 1/8 inch Flat Iron with Bamboo-Carbon Ceramic Technology, Carbon Smooth Extra-large Thermal Round Brush, and AdjustaCurl Self-Grip Rollers. The most useful out of the three for my hair is the flat iron. I have crazy, coarse, thick, curly hair. I thank the Native American side of my family for that splendid trait (sarcasm). The flat iron is 1 1/8 inches wide. Like I said, I have a LOT of hair. I normally use 2-3″ flat irons to cut down the straightening time. Because, let’s face it, when you’re applying 400 degree heat on your hair, you’re going to sweat. While the time it took to complete my whole head was extended due to the width of the flat iron, the fact that it is infused with bamboo extract offsets it. Bamboo extract gives your hair a radiant shine, long-lasting results and my favorite – anti-frizz protection. Straightening super curly hair usually equals super frizzy hair. That is no longer the case with this flat iron. It is able to reach up to 410 degrees and only takes a mere 30 seconds to heat up and ready for use. This Conair flat iron can also be used to add volume to your hair by adding curls to it. When I straighten my hair, I often employ the aide of a brush. Typically, I steer clear of round brushes due to a traumatic childhood incident. When I was younger, I accidentally got my hair tangled up in a round brush, and in order for my hair and this brush to part ways was for me to endure an ungodly amount of pain. With Conair’s Carbon Smooth Extra-Large Thermal Round Brush, that memory has long faded. Just looking at the brush, I could tell that it was less threatening. The bristles were really soft, as to not tangle tangle-prone tresses. This brush is fantastic not only to use when straightening your hair, but when you’re blow drying it or merely wanting to add some shine for a polished look. You can purchase the Conair 1 1/8in flat iron for $40.99, the Carbon Smooth Extra-Large Thermal Round Brush for $9.99, and the AdjustaCurl Self-Grip Rollers for $14.99. All products are available at Conair.com and mass market and drugstore retailers. Stay connected with Conair via Facebook! The flat iron looks great! My sister in law has very curly hair and would love this! Mine is fine and straight! I could definitely use something to make my hair look nice all the time!